From June to September there are yellow buoys placed along the Baie des Anges at a distance of 300m from the shore. The buoys signal the swimming area and private boats may not pass. Occasionally you will see a city boat passing close to the shore in order to monitor water quality. Certain private beaches have special play areas or pools for children (Ruhl, Neptune, Bambou) if your tots get tired of throwing stones into the water! To be safe, you'll want to keep an eye on the kids or choose one of the public beaches with lifeguards. Beau Rivage, Forum and Fabron beaches all have indoor showers, locked luggage facilities and restrooms that you can use (for a fee) all year. The facilities are monitored and well-maintained--not at all grotty. From June to September each first-aid station flies flags. Bathers need to watch two flag sets: water quality and sea conditions. For water quality a blue flag means clean water and a yellow flag means that bathing is inadvisable. For sea conditions, a green flag means that a lifeguard is on duty and conditions are good; an orange flag means that conditions are dangerous either because of an agitated sea, currents, jellyfish or other condition; a red flag means that bathing is forbidden. Nice beaches are composed of pebbles, not sand. The good side is that you don't have to worry about sand in your bathing suit. The bad side is, well, obvious. Generally, the pebbles are smaller and more comfortable around the centre of the Baie des Anges and larger at either end. Castel and Carras beaches have larger pebbles. Some would call them rocks. 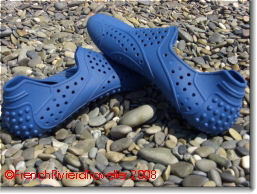 For walking, I recommend that you buy plastic shoes to protect your feet and make it easier to get in and out of the water.. I like the blue rubber shoes (see photo right). You can even swim in them. Two beaches have full handicapped access: Centenaire and Carras. On these beaches there are ramps for wheelchair access, special mats on the beach to station the wheelchairs and specially trained personnel at the first-aid station. On Carras there's even an "audioplage" system to aid the visually impaired. Click here to see the beaches with lifeguards. There are lifeguards on duty daily from 9am to 6.30pm from mid-June through mid-September. Carras, Forum and Beau Rivage beaches have lifeguards on weekends in May. There's also a special boat that patrols the Baie des Anges ready to assist swimmers in trouble. The Baie des Anges is not generally ripped by currents and tidal movement is negligible. That's not to say that it resembles a lake every day! The winds that blow across the bay can make the sea quite agitated and dangerous for inexperienced swimmers. 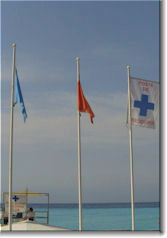 If eyeballing the sea leaves you in doubt, check the flags (see above) that signal the condition of the sea. As far as children are concerned, be aware that the drop off can be quite steep. One minute they're wading and a few feet further, they're over their head. The safest solution is to swim only on beaches with lifeguards. The other danger of Nice beaches (indeed the whole Cote d'Azur) comes from below in the form of jellyfish. These insidious creatures generally infest the water in swarms which you can see from the water's edge. Their sting is rarely dangerous but can be quite painful. You will know when you are stung at it looks and feels like a burn. Head immediately to one of the first-aid stations as the personnel have the only effective treatment. Do not immerse the stung area in fresh water as it will only become worse. 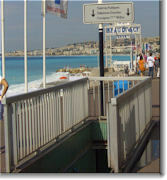 Each public beach in Nice is equipped with two free outdoor showers and a tap for drawing drinking water. It's cold water only though! It's forbidden to use soap or shampoo at these showers. If you need the whole clean experience, including hot water and soap, you can use one of the paying indoor showers at the following public beaches: Beau Rivage, Forum, Fabron (Bambou). These indoor showers are open 10am-7pm in summer but hours are shorter the rest of the year. Private beach-restaurants also provide indoor showers. You can rent canoes, kayaks and rafts, go jet skiing, parasailing or play beach volleyball but not on all beaches and not all the time. From mid-June to mid-September, head to Carras or Ponchettes for beach volleyball, Opera, Le Sporting, or Blue Beach for paddle rental and Carras for jet skiing. Paying indoor toilets are at Beau Rivage, Forum, Fabron (Bambou) beaches and are open all year. Entrance is on the Promenade. There are also public toilets (beach entry) on Centenaire and Blue Beach open in the summer. There are also portable toilets stationed on most beaches in July and August.